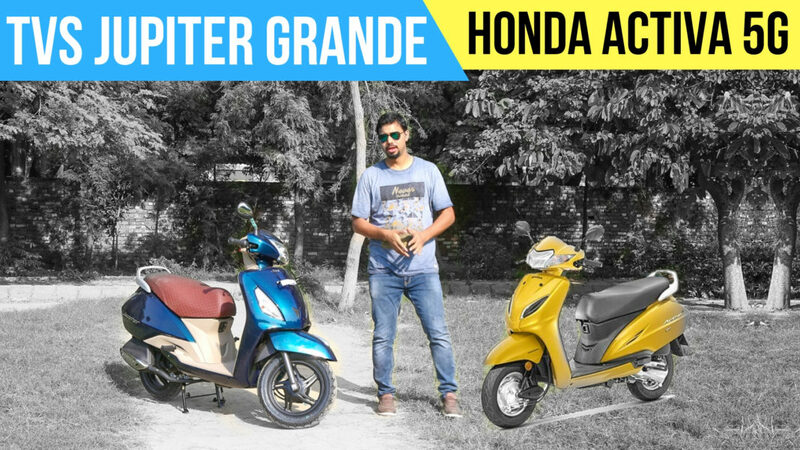 Home Bikes News TVS Jupiter Grande VS Honda Activa 5G, Which One Is Better? There is no doubt that the TVS Jupiter is one of the best selling scooters in India but when it comes to sales figures the it is nowhere near its Japanese rival Honda Activa. However, TVS is hopeful that they will close the gap between their biggest rival and thus decided to introduce a new variant of the Jupiter. There are no changes made to the powertrain of the newly launched TVS Jupiter Grande. Thus, it is powered by the same 109.7 cc single cylinder petrol engine which generates about 8 bhp of peak power and 8 Nm of torque. The engine is paired to a CVT gearbox. The Honda Activa 5G, on the other hand, is powered by a 109.2 cc single cylinder engine which produces 8 Bhp of peak power and 9 Nm of torque. This engine too is paired to a CVT gearbox. Both the scooter generates almost the same amount of power while the Activa generates slightly more torque than the Jupiter Grande. Both the scooters does not offer same fuel efficiency figures though. The TVS Jupiter promises to offer around 62 km of fuel efficiency figures while the Honda Activa 5G promises a claimed fuel efficiency of 60 km to a litre. The Grande is slightly more fuel efficient in comparison. The newly introduced TVS Jupiter Grande uses the identical suspension setup which can also be seen on standard Jupiter. The front gets a telescopic fork while the rear profile uses a gas charged monoshock setup which is also adjustable. The scooter is offered with both drum and disc brake setup. The Honda Activa 5G, on the other hand, gets Spring Loaded Hydraulic Type setup for both the front and rear profile, disc brake availanle in top variant of Grande too.. The Activa 5G does not get disc brakes and relies on 130 mm drum brakes for both its wheels while CBS is available as standard. Both the scooters look clean in terms of styling. The recently launched TVS Jupiter Grande shares the same bodywork with the Jupiter but gets some additional features in the form of new LED headlamps with integrated LED DRLs – just like what we can find in the already launched Honda Activa 5G. The Jupiter Grande also has been fitted with a new semi-digital instrument cluster which is also present in the existing Activa 5G. In terms of cosmetic updates, the recently launched TVS scooter features a brown seat with quilt finish which looks quite premium and is the only feature which you won’t find in its rival. Both the TVS Jupiter Grande and the Honda Activa 5G offer similar kind of features. Both the scooter gets impressive under seat storage with mobile chargers while Honda also offers a new 4-in-1 lock with seat opening switch which comes in quite handy at times. Both the scooters also get tubeless tires for the convenience of the rider. LED headlamps now come with AHO feature as standard to offer better visibility at night. The TVS Jupiter Grande has been priced at Rs. 57,800 ex-showroom Delhi while the Honda Activa 5G is priced at Rs. 53, 565 (standard) and Rs. 55,430 (Deluxe) ex-showroom Delhi. The Activa’s base variant is cheaper than Jupiter Grande’s but the latter offers more features. Both the Honda Activa 5G and TVS Jupiter Grande offer similar kind of features and power. The TVS scooter is priced slightly higher than its Japanese rival which also provides CBS system. In terms of fuel efficiency figures, both the scooters are almost close but Jupiter Grande edges by 2 kmpl. Since we have tested them, we can say that the Jupiter offers better ride quality while the handlebar is very lighter as well offering good manoeuvrability. It also is the easier scooter to ride in traffic conditions and the handling is better. Moreover, the TVS Jupiter Grande has 12-inch wheels as opposed to Activa’s 10 inchers. The Grande also comes equipped with telescopic and monoshock suspension setup and has new eye-catching colour combination with sporty alloy wheels. Additionally, the scooter offers better build quality in comparison. Different alloy wheels and disc brakes will be offered in top-end variant with machined cut alloys and body coloured grab rails.